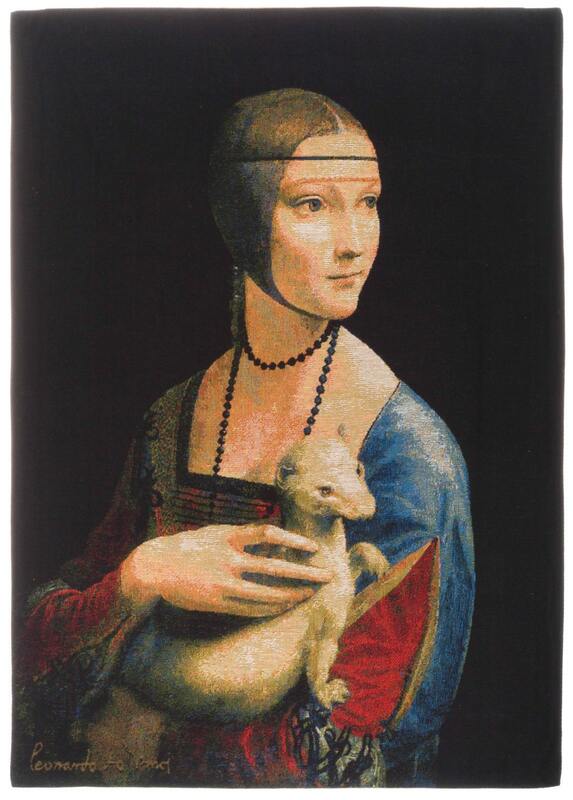 This Museum Collection wall tapestry shows the paintingLady with an Ermine by Leonardo da Vinci. The subject of the portrait is Cecilia Gallerani, and painted at a time when she was the mistress of Ludovico Sforza, Duke of Milan, and Leonardo was in the service of the Duke. The painting is one of only four portraits of women painted by Leonardo, the others being the Mona Lisa, the portrait of Ginevra de' Benci, and La belle ferronnière. It is currently being displayed at Wawel Royal Castle whilst renovations are being carried out at the painting's home, Czartoryski Museum, Kraków, Poland. This wall tapestry is woven in Belgium on a jacquard loom with 100% cotton thread. It is lined with a beige cotton backing and is finished with a rod sleeve. The gobelin quality is obtained by a denser, thicker weft and as such is somewhat heavier than the regular tapestry quality.